Should plastic bags and straws be banned from Florida businesses and stores? A South Florida lawmaker wants to ban plastic bags and straws. 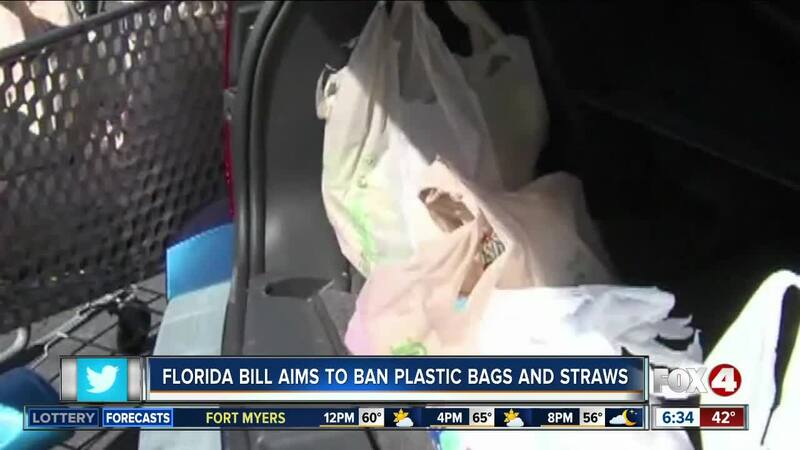 State Sen. Kevin Rader, a Democrat whose district represents parts of Palm Beach and Broward Counties, filed the bill last Thursday, which is titled "Prohibition of Plastic Carryout Bags and Straws." It would ban stores and food service businesses from giving plastic carryout bags and plastic straws to customers. Instead, they would get bags and straws made from natural or certain synthetic materials. This would apply to restaurants, coffee shops, grocery stores, convenience stores, drug stores, liquor stores, movie theaters, and other businesses. Stores that break the law would be fined up to $500 for the first violation, and up to $1,000 for the second. In the U.S. alone, we use 100 billion plastic bags every year, according to the Earth Policy Institute. Many businesses are already being proactive about using environmentally friendly and recyclable products, but some small businesses said this would hurt their business tremendously if they're forced to eliminate plastic bags. "Every order, take out, delivery, goes in plastic bags, you know, every pack up order," said Rachele Brody, customer service manager at Keese's American Mediterranean Grill in West Palm Beach. "People who dine in and don't finish their food, we send them with a plastic bag." Plastic bags are so vital to business at Keese's, they can go through at least two boxes of 1,000 plastic bags every week. The alternative of paper bags, Brody said, would not be good for business. "It would be very bad to send the deliveries in paper bags because all the food and the liquid, heat, and condensation would break through the bag easier," said Brody, who added that paper bags would be an additional cost that would eventually have to be passed down to the consumer. Down the street, Kapow Noodle Bar gave up on plastic straws long ago and doesn't use plastic bags. "I don't think I've ordered straws in over year," said Kerri Powers, General Manager of Kapow Noodle Bar. "We have our recycled bags that we use, this recycled plastic silverware, paper lids and recycled aluminum containers." They even use cloth napkins. "We try and make sure our impact on the environment is as low as possible," said Powers. The Science Advances Journal estimates plastic bags in landfills can take 200 to 1,000 year to decompose. Brody said there needs to be a push for a better, cost effective way to bag. "Better materials and better for the environment, but better for us too, it can't hurt our business," Brody told WPTV. If passed, the new law would take effect on July 1.